Keeps your distributed team connected. A private communication and engagement platform designed for speed and organization. Functions like Messenger, Facebook, and E-Mail in a private environment controlled and managed centrally, by you. Includes forums, event management and push notifications. Social Haven has complete support for Calendars, Events and RSVPs. This feature allows you to view & edit Act contacts and contact fields. This feature allows you to drill down to your customers accounting information . e.g. Sales Orders to Sales Order details. Bulletins are the primary method for "us to them" communication. It allows you to send a consumable piece of information to everyone, a particular class, a certain group, or even a unique person. The social features are designed to be the place that your users return to every day. They expect new information to appear as often as they see it happen on Facebook or LinkedIn. It is up to you to train your staff to submit appropriate amounts of content to satisfy the hunger. Access Contact, Opportunity, & Calendar details so you're informed & prepared while on-the-go with Act! Premium Mobile — at no extra charge. 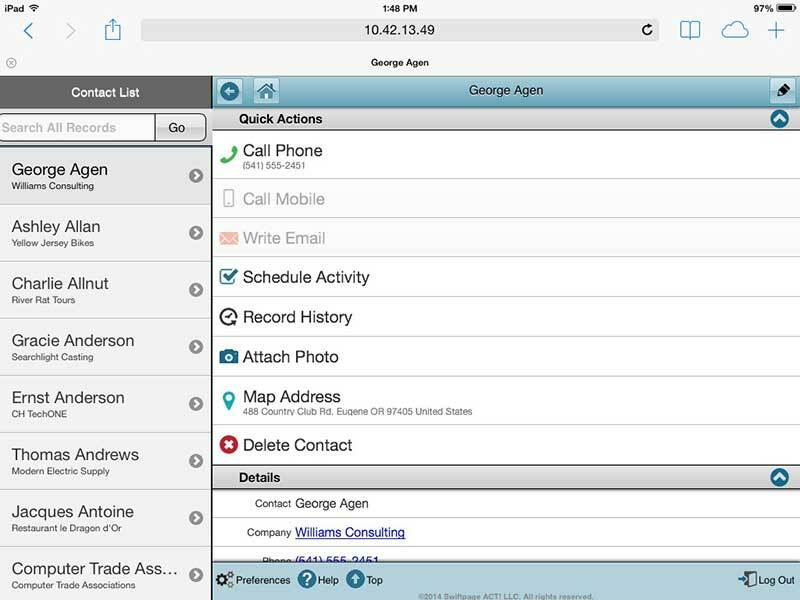 Stay connected to your business by accessing key Contact, Opportunity, and Calendar details from your iPhone®, iPad® or Android™ device. Easily view, add, and edit Act! contact details, notes, history, activities, as well as groups and companies for a powerful? advantage in the field. Keep your team on the same page since workgroups have secured, shared access to the most recent Act! details. Work online to access and update data real-time, or work offline and sync changes when you connect next. The Act! offline client has full functionality so you don't lose productivity when you're disconnected. Create, update, and delete contacts on-the-fly. Schedule and update activities and to-dos. Capture important history items and associate history to contacts or users. Stay connected to key Act! Premium details from wherever you are with Act! Companion, a native mobile app designed for iPhone®, iPad®, and Android™ — a valuable active subscriber benefit! Create and update contacts, receive alerts for upcoming activities, capture important history items, and get driving directions with maps. Best part, Act! Companion is included in your active Act! Premium subscription at no extra charge! Already use Act! Premium Mobile? Act! Companion is designed to work in tandem with Act! Premium Mobile, not in place of. Because it's a native mobile app, it leverages the features on your phone to communicate key Act! Premium details to you. A push notification system informs you of things like upcoming activities via home screen pop-ups. It also lets you make quick and easy updates, without having to log in to the website—simply tap the app and go! Receive alerts for upcoming activities so you can plan for what's next. Capture important history items and associate history to contacts or users with @mentions. Get driving directions, find nearby places of interest, and navigate to meetings with maps. Enjoy quick access to your Act! 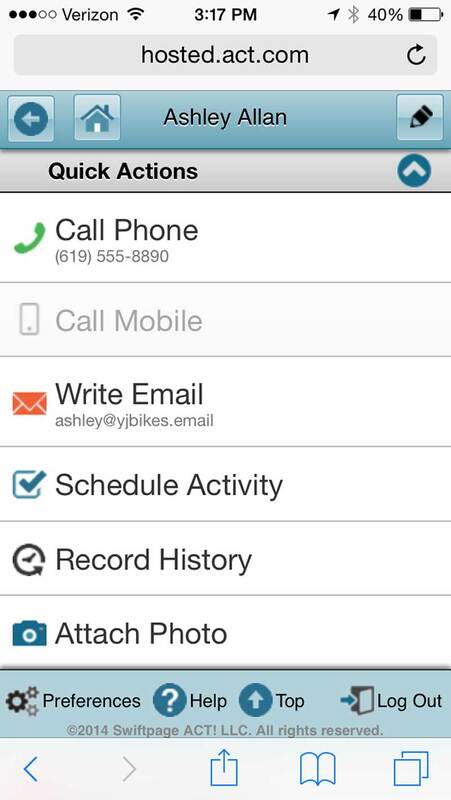 contacts, activities, notes, and history from your mobile device2. Clear activities, schedule follow-ups—all the key tasks you perform in Act! are just as obvious in Handheld Contact. Anyone can setup Handheld Contact—it's easy to install. It's simple to use as well, because Handheld Contact is a native mobile app that's easy to navigate and doesn't rely on the internet. 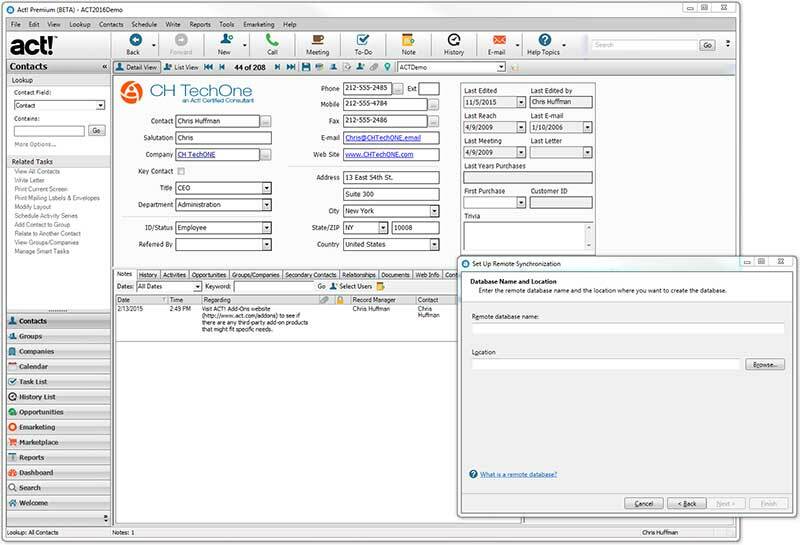 Handheld Contact doesn't require you to setup and configure servers or use other third-party apps or services. Your data is encrypted during syncing and not permanently stored.